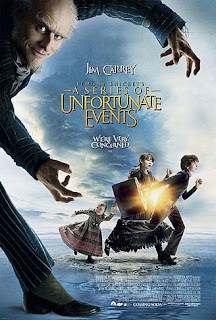 Within the first pages of the first Lemony Snicket book you pick up the author warns the readers to put the book down, for the stories contained within the pages of the book describe horrible things that are about to happen to our main characters (who happen to be children), and they are not for the faint of heart. Of course, the books are written to target children specifically, and what kid is going to say no to an invitation like that? The marketing is brilliant when you think of it. 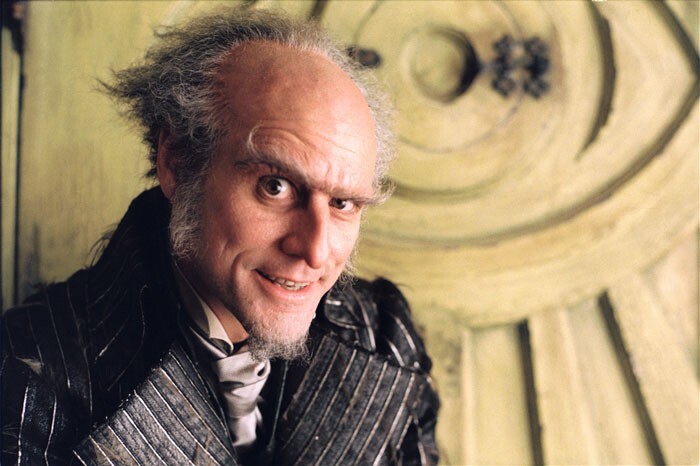 The sales-pitch didn’t work so well for the film adaptation “Lemony Snicket's A Series of Unfortunate Events,” which stars Jim Carrey as the villainous Count Olaf and spends almost two hours torturing our lead characters. After the film’s failure people spent lots of time trying to figure out if the source material was simply too cruel to sell to a family audience. At first I was inclined to agree, except that recently the franchise was revived as a TV series on Netflix, where families have no only embraced the darkness of the premise, but have even found the series delightful despite it. So, what happened? Why does this film version not work where the TV version does? Should we compare the two to find our answer? Actually, there is no reason to compare the two, because the movie itself clues us in on all the reasons why. It’s not that the material is dark, but that it isn’t dark enough. 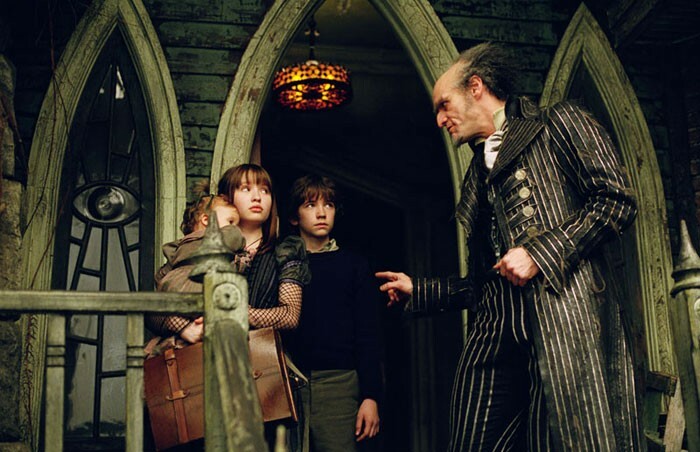 Though Lemony Snicket is our humble narrator, he simply describes what is happening on screen rather than playing with his verbal superiority that the audience likely doesn’t have. 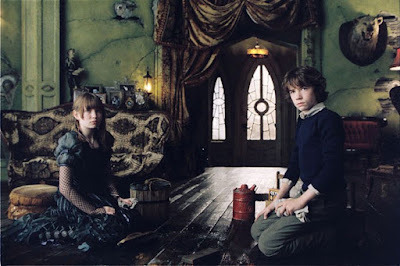 The Baudelaire children are all likable and we want them to win, but after being passed from one legal guardian to the next, we start to tire of the moving. This is a movie that captures us with an interesting premise, a strong lead performance by Carrey, and then continues to go around in circles where even an appearance by Meryl Streep can’t save us. Without comparing the two mediums, it should be noted that “A Series of Unfortunate Events” works as a book series more because of the witty verbiage to be found by the author, who teases the audience with his knowledge of sentences and phrases that were years beyond the target audience. This may be why many teachers recommended the novels to families despite the dark material: because it taught them the English language in a way that was fun and inventive without being preachy. The movie, in contrast, is unlikely to inspire much for film makers. There is a look to all this that is unique, but it is never charming, and, for me, I found much of it to be dreary. Maybe it was to match the terrible things that were happening, but it almost adds insult to injury. Now we have the TV series, which is I think this belongs. The audience can take breaks between the bad things that happen and the episodic nature of the storytelling doesn’t have to be so apparent. “Lemony Snicket's A Series of Unfortunate Events” one probably one of Nickelodeon’s more ambitious efforts in regards to their theatrical releases, but I think the material was the film’s own worst enemy. It is never as clever as it wants to be nor depressing enough as it needs to. It tries to find a middle ground that was never going to be solid enough to hold the weight of the ambitions the film makers likely had when putting this together. Ultimately, a series of unfortunate events probably kept this from being what it needed to be…which is disappointing but somehow fitting at the same time. Parents, there is some minor language as well as the whole dark mood of the subject matter, but it is rarely to the point where it is disturbing or scary so...make of that what you will. Recommended for ages 8 and up.